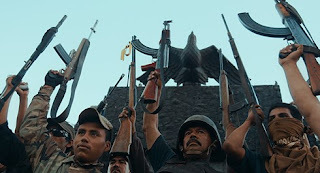 In this ice-cold documentary we are taken into the lives of two vigilante groups, the Autodefensas and the Arizona Border Recon, who are trying to stop the vicious Mexican drug cartels. Tim "Nailer" Foley heads the Arizona Border Recon and Dr. Jose Mireles leads the Autodefensas. The film opens with a crystal meth producer stating how he is in this business because he came from poverty. It is such a reality check kind of statement when one realizes he is interacting with one of the most dangerous organizations in the world. Mr. Foley explains to the camera that what the hell is he going to do if he gets attacked if the closest police are an hour and a half away. That statement puts the audience in the method of thinking of his group. We instantly understand why these people are risking their lives or peace. One of the first scenes in Mexico is a funeral of several people who were brutally murdered by the cartels. Some of these people were young children who were smashes against rocks and thrown into wells. The baby doll in a white dress that is put on top of the casket is so chilling because of the terrifying circumstances. The government in Mexico seems to bring no justice to the people of Michoacán against the merciless Knights Templar. To think of how these people live with no one to count on can just make one go insane. When we are led into the Autodefensas world the families of the members say that they all know someone who was brutally handled by the cartel. Several sickening things are described and shown in the film. Heads on the concrete and a woman telling a story of being raped in a pit of body members are some of these things. When Dr. Mireles nearly dies in a plane crash with the cause unclear the threat of the cartels to the Autodefensas comes even closer. Another man in the crash has spinal cord injuries and half of his face paralyzed. Tim “Nailer” Foley spots scouts for the cartels with his men in one scene and has a bunch of Mexican men set to Border Control. He says he sees the people with the scouts as casualties of his war with the cartels. One of the most painful scenes in any documentary I’ve watched is one where an innocent man is captured in front of his family. His daughter is screaming that she will kill herself if her father is taken away. The Autodefensas do this and then hold him in a room where there is screaming of torture. The camera gets bewildering access to this Autodefensas base and capture the man’s face with his eyes squeezed shut. I was really shown the downgrading of the Autodefensas as mixing with criminal behavior. Director Matthew Heineman made my eyes bleed at this excruciating truth of Mexico.